What's Your STEM Lab Design Vision? Get Your STEM Lab Customized Today! STEM labs continue to increase in popularity as the nation aims to educate and train a cutting edge workforce. 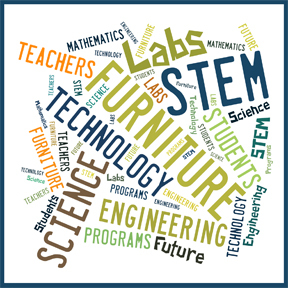 Interior Concepts has years of experience designing furniture for labs and we have firsthand knowledge by designing and installing furniture for STEM labs to make them the best learning environment possible. Though each school has a slightly different vision for their lab, we have found that successful STEM classrooms have three key areas: a traditional lecture space, a workshop/hands-on area, and a computer area. The goal is to create an environment that will help to facilitate learning by designing flexible spaces that allow students to focus on collaboration and innovation. Contact Us and we will put you in touch with a project manager or local representative that will work with you to find the best solution for your STEM Lab design. First they will create an initial layout of your space based on your needs. From there you will have a web conference with your project manager, anyone at your school that you wish to have involved, and an Interior Concepts design engineer. On the web conference the design engineer will make lives changes to your design in 3D to turn your vision into a reality.